The Danish capital becomes a sparkling wonderland, complete with festive markets, roasted almonds, mulled wine, and more. Winter in Copenhagen, Denmark’s capital, is truly magical. Twinkling lights line streets crowded with shoppers, the gløgg (Copenhagen’s version of mulled wine, made with spices, raisins, and almonds) is flowing, and the hygge is on overdrive. As the temperature drops and the holidays draw nearer, the city’s festive spirit becomes more apparent—the Nyhavn canals lined with tall, bright houses are adorned with wreaths, Christmas markets await around every corner, and the scent of pine mixed with roasting almonds makes it extremely hard to be a Grinch. Yes, it’s cold—expect average temps to hover around 36 degrees. And it gets dark around 3 p.m. But bundling up and wandering around the lit streets and markets is part of the fun. And if you’re not sold, don’t discount the power of mulled wine for keeping people warm and happy—there’s a reason it’s everywhere. Copenhagen’s Christmas markets offer some of the best shopping in Europe, from low-cost tacky souvenirs to impressive design-forward housewares that Scandinavia is known for. Each market has its own flair, but you can be sure you’ll find a cup of that good old gløgg at each of them. For one-of-a-kind artwork and gifts, don’t miss the market at the Royal Danish Academy of Fine Arts. The academy’s students and employees sell their own work, with ceramics, paintings, drawings, and handcrafted avant-garde jewelry presented. Kronborg Castle, which was the setting for Shakespeare’s Hamlet, hosts a fairy-tale Christmas market that features horse-drawn carriage rides, children’s ballet performances, and more than 100 different stalls selling silver jewelry, clothes, wooden toys, and Christmas delicacies like risalamande (a cold rice pudding with almonds), gingerbread cookies, marzipan, and klejner (a fried dough pastry). 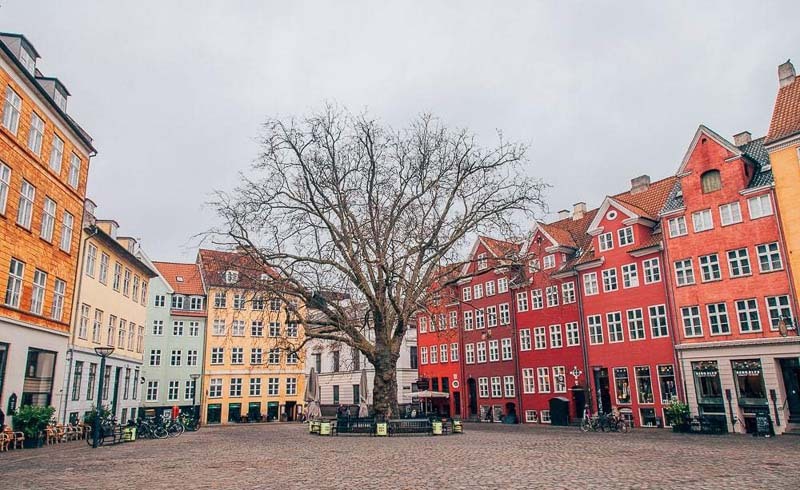 While it may not be one of the best markets, it’s worth strolling the stalls at the picturesque Nyhavn—if only for the Instagrams. The canal is dotted with boats strung with lights, and along one side are stalls selling a mix of handmade and kitschy gifts. 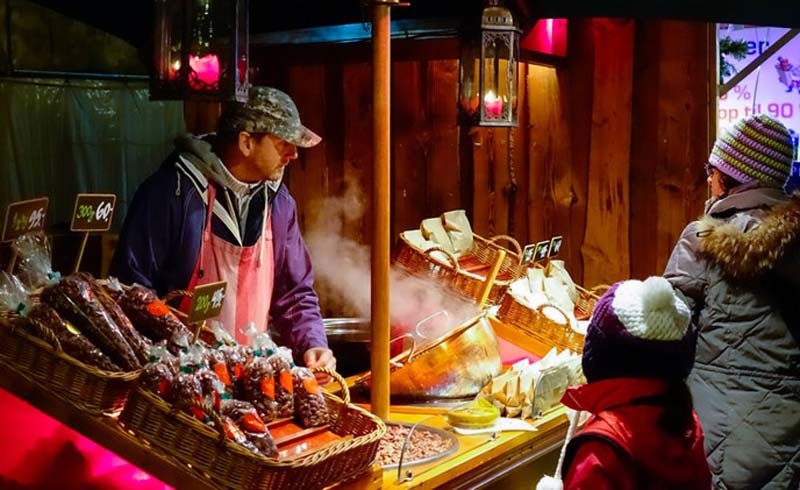 You can also find traditional snacks like æbleskiver (freshly baked mini Danish pancake balls) and classic Danish hot dogs. Over at Tivoli Gardens, one section of the amusement park is devoted to mini pop-up shops for brands like homeware brand Nordic Nesting and chocolatier Hotel Chocolat. 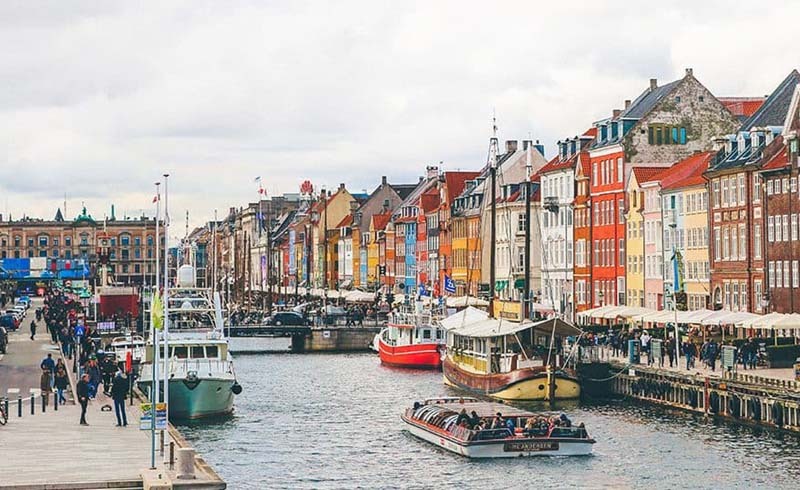 Plus, some of Copenhagen’s popular stores such as interior design mecca Illums Bolighus have mini outlets here too, making it easy to take care of your shopping list all in one place. The “alternative neighborhood” of Freetown Christiana hosts an indoor Christmas market, and it’s the place to go for unique handcrafted gifts like funky beaded jewelry, wrought iron candelabras, and hand-cut paper mobiles. Tuck into a traditional Danish Christmas lunch at restaurants such as Ida Davidsen, Slotskælderen, and Restaurant Kronborg. The meal usually includes “snaps”—shots of aquavit, a neutral spirit made from distilled grain alcohol that’s sometimes infused with spices—alongside the roast pork, potatoes, and pickled red cabbage. It usually ends with a helping of rice pudding. Stop at Denmark’s oldest confectionery, Conditori La Glace, for traditional Christmas treats like brunkager and klejner, and chubby pigs sculpted from marzipan. To sample modern Danish cooking, head to one of the city’s food halls such as Torvehallarne or the Paper Island Street Food Market. And seasonal street snacks can be found everywhere. Copenhagen’s holiday cheer is on display all over, but a few key spots really take the spirit to the next level. The historic D’Angleterre Hotel, a top choice for a luxurious stay, has been in the central Kongens Nytorv Square since 1755. Every holiday season, the building’s facade of windows is transformed into a gigantic advent calendar, with hundreds of people gathering each night in December to see the meticulous design unveiled. Each year has a different theme—last year’s was Hans Christian Andersen’s fairy tales, and 2013’s was The Nutcracker. This year’s theme will be revealed on November 23, 2018. 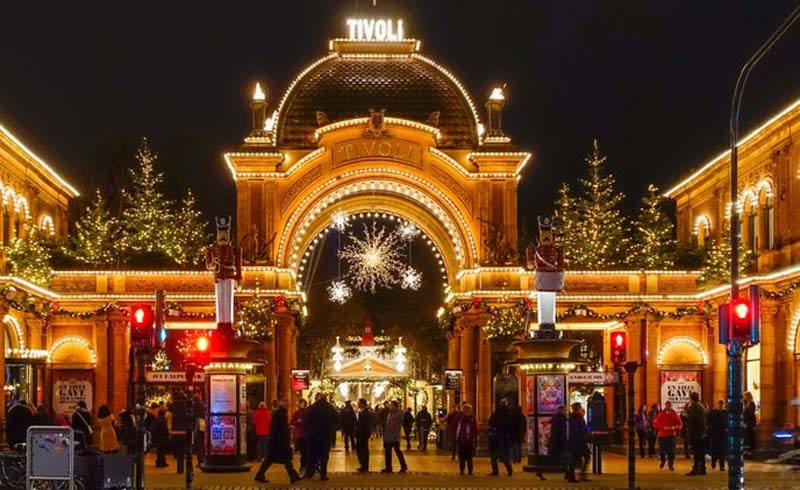 A surefire contender for the most lights in the city is Tivoli Gardens, the world’s second-oldest amusement park, with more than half a million strung up around the park. Tivoli is truly transformed into an enchanting winter wonderland, complete with wooden houses, jolly snowmen, and glittering icicles. After some rides, twirl around the ice-skating rink in front of Nimb Hotel. The 38 rooms are perfect for a post-skate stay, and they recently opened a new spa and wellness center for ultimate holiday relaxation. If the cold is getting to you, hide out in the Black Diamond, the wing of the Royal Library housed inside a modern cube of a building designed by Danish architects Schmidt Hammer Lassen. Inside, you can find a selection of Søren Kierkegaard’s manuscripts, a massive mural by artist Per Kirkeby, and plenty of cozy couches.